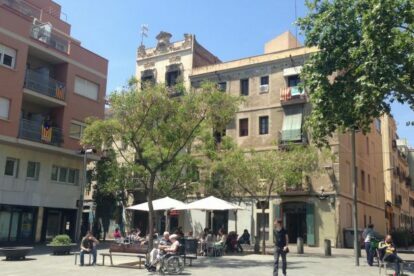 This popular, friendly café-bar is in Plaça del Diamant – the square which shares the same name as the well-known novel by Mercè Rodoreda (In English: In Diamond Square or The Time of the Doves). Until very recently I used to come here with a very good friend every Wednesday lunchtime. Because of a change of schedule I now go to Velódromo every Wednesday. I would often have a Praga, a hamburger with gorgonzola cheese, champiñones (mushrooms), lettuce and tomato, served with potato wedges. Or, a Provença, a very tasty enrollado (wrap) filled with chicken and herbs, guacamole, lettuce and tomato (€4.20), while my friend would likely have a Viena, a hamburger with edam cheese, lettuce and tomato, or a Tanger, a wrap filled with chicken and herbs, sweated onion, tomato and lettuce. You may prefer one of their chapatas (ciabattas) amb tomaquet (between €3.40 and €5.70), or a hot panini, or a fresh salad (between €6.30 and €7.30). Or, you may want to try their nachos. Their homemade burger patties are very tasty and light, not at all greasy. They taste like they should be healthy. There’s a selection of dishes suitable for vegetarians, including hummus, aubergine (eggplant), brie, mozzarella, manchego and goat cheeses. The coffee is good too, and their tallat amb canyella (espresso with a little milk and cinnamon) (€1.25) is worth trying. And, they serve a selection of teas and infusions. They host regular selling exhibitions of paintings, photos, drawings and mixed-media work by locally based artists. Good spot for a light lunch.